When I was going through tech school in the mid 90’s we were witnessing the phasing out of pen plotters and digitizers along with the introduction of mid-level 3D modeling software like Solidworks, Mechanical Desktop, and the kickass 3D animation behemoth known as 3DS Max…. all on the Windows operating system, if you could believe it! The talk, not only by my instructors, but in the industry as a whole, was of the “paperless” office… no printing, no paper, no stale drawings on the shop floor, terminals everywhere, and the machine operators viewing, using, and marking up the drawings right from their mills and lathes. Sounds great right? Fast forward 20 years and although a small percentage have reached the paperless office, the majority in the manufacturing realm are still pumping out paper drawings at a feverish pitch, probably resulting in more paper now than 20-years ago. The concept of documenting and detailing the 3D model is not a new concept. The idea is to forgo 2D drawings and replace them with the 3D model containing all the dimensions and annotations required to manufacture the component. I remember seeing this demoed in the late 90’s (I don’t remember by who though), it showed very well, it got people excited, but it was much too soon for its time. Fast-forward to 2012-2013 and Autodesk played with the idea with their 3DA add-in for Inventor (was available on Autodesk Labs). Autodesk was excited but found a collective “meh” from the intended audience based on the feature set presented to them. Noone really jumped up and down with excitement, Autodesk didn’t get the warm and fuzzies, so as far as I can tell its a dead Autodesk development (for now). Product and manufacturing information (PMI) is the act of creating all required manufacturing information and annotation on the 3D CAD model. This information is then used down-stream in processes like CAM, but also for viewing by other non-CAD people and departments without requiring access to the originating CAD system (hence drawing-less). What’s important with PMI? Its not just the model with some dimensions. The 3D views contain geometric dimensions & tolerances (GD&T), 3D annotations (like text and leaders), Surface Finish, and meta data (BOM, material, volume, mass, etc). Why are we not all doing this? Why isn’t PMI widely accepted? There are many reasons why people continue to print drawings on paper and many who claim they will hold those paper drawings until the day they die. Some of this reasoning I’ve experienced at work, many I’ve seen first hand during my days as an Autodesk reseller. Here are the challenges many face when trying to implement PMI or will face with Solidworks MBD. CHALLENGE #1 – The Older Generation. There is still a generation of machinist, welders, fabricators, and so on that are just not comfortable with a computer and would succumb to shear panic if forced to use one, as opposed to a paper drawing. These are the people whom read the newspaper every morning (not digitally), who read paper books, and have a flip phone from 1995. There is nothing wrong with this, its just what they know. They are extremely good at their jobs, its just a huge leap for them to remove the paper and go digital. Along with this mentality are the people who claim you can’t properly review a document on a computer screen, that it must be printed to properly read and understand. Manufacturing plants and shop floors are plagued with older computers (DOS, Windows 95, etc) or no computers at all. In some cases its just because nothing else was required, in some cases its what’s required to communicate with the existing equipment. Other infrastructure issues include zero or limited network connectivity and no WiFi. If there isn’t a computer (or smart device) connected to the network, its difficult to see something. Also many manufacturing areas are not always clean; its not always easy (or convenient) to protect a monitor from flying weld splatter. CHALLENGE #3 – Vendors & Suppliers. Paper is universal, so are PDF’s of Drawings and DXF is almost universal. Distributing PMI style information to outside sources can prove difficult. Do they have the right software? are they capable of using it? Can they easily integrate the information into their lasers, plasmas, and other equipment? This is a struggle for many organizations, not just with sharing PMI, but 3D CAD data in general. CHALLENGE #4 – Customers demand specific deliverables. What if the deliverable is AutoCAD drawings? Solidworks or Inventor solid models and drawings? The customer is always right, right? CHALLENGE #5 – Signed Contract Documents. There are still many situations where a physically signed drawing is a requirement for a contract, very difficult to achieve with PMI. CHALLENGE #6 – Historical Copies. Will we still be able to access our PMI models in 30-years? What if Dassault goes out of business? What if Solidworks MBD does not gain traction and they drop it? What if the internet is a fad? What if Terminator or the Matrix becomes reality? There is much doubt, not just about maintaining the electronic data, let alone how will it be accessed in 30+ years. I was once at a shop where they showed me a paper drawing from the 1920’s which they pulled out of archives, to manufacture as per there customer’s request. They had not manufactured this component in over 70 years! What makes Solidworks MBD different? I’ve only seen Solidworks MBD on YouTube, and it looks slick, very well thought out… but doesn’t everything new? Why would Dassault introduce this when no one has succeeded before? I think Dassault is playing a hunch here. The industry is changing… quickly, and they want to be out in front. 3D Printing, social-media inspired design & collaboration, the internet of things are all being thrust to the forefront. This is not your father’s or grandfather’s manufacturing anymore. With Solidworks MBD its a bit of “if you build it, they will come“. Provide the tools and let people take it and run with it. With Solidworks MBD they answer many of the challenges listed above. Solidworks MBD supports industry standards Military-Standard-31000A, ASME Y14.41, ISO 16792, and DIN ISO 16792. 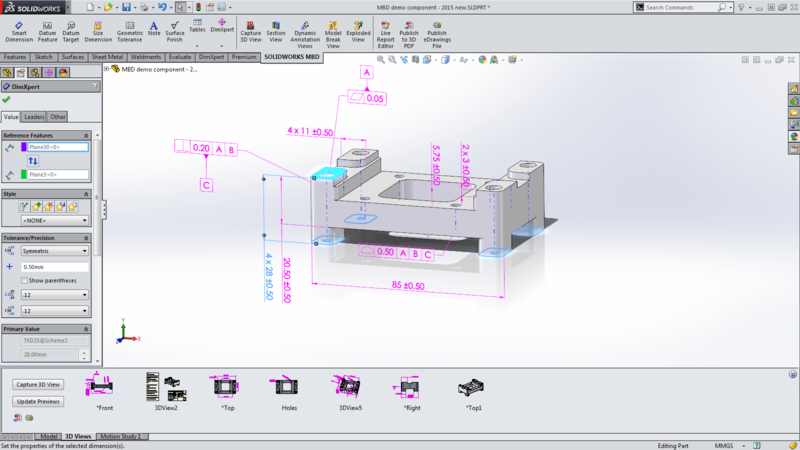 Maintain the MBD at the same level of standard you do your 2D Drawings. They chose to support many viewable file formats, but the key ones being their own widely used and accepted eDrawings format, as well as the defacto standard for sharing information PDF. Especially with 3D PDF’s, who doesn’t already have Adobe Acrobat installed? The final deliverable looks good. We are working to get our hands on it, to try it out for ourselves. Once we do I’ll post a follow up to this article, where I will actually review the product. For now, take a look at your own organization, could you implement Solidworks MBD and remove paper drawings? If not, let us know why by posting a comment. If you are already using a form of PMI post a comment and let us know what.